Jobst Sensifoot Sport Compression Sock in the Over the calf style is perfect for today's active lifestyle in a knee high length for men and women. 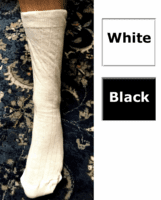 This support sock helps reduce swelling in the leg and ankle and keeps the calf warm and protected with 8-15 MM compression. Runners love the durability and long lasting support. 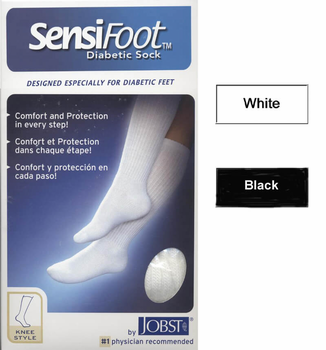 The light Jobst Compression Sport Sock was specially great for diabetic patients looking for the smooth toe seam, extra padding under foot, moisture wicking yarns, antibacterial/antifungal finish, knee high length, and mild 8-15 compression that is great for everyday wear. We liked this sock a lot because of its very soft feel. 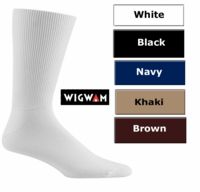 This Jobst sock is 80% Acrylic, 17% Nylon, and 3% Spandex. Machine washable in warm water. Do not use bleach and dry at a low temperature. Jobst products are quality Made in the USA.